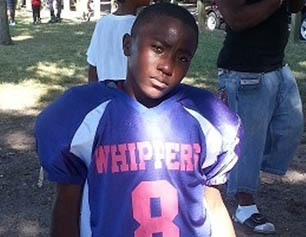 JACKSONVILLE, Fla. - A family is struggling with grief and disbelief after police say an 11-year-old Jacksonville boy was shot and killed by his 12-year-old nephew in a terrible accident, CBS affiliate WTEV in Jacksonville reported. Montrez Borroughs, who lived in Jacksonville, was on a visit to Savannah, Ga., when the accident occurred Friday. The two boys were playing with a gun when it went off and a bullet struck Montrez in the chest, Savannah police said. "It really hasn't hit me yet, but it hits the family. But it's like it's not real," Montrez's cousin, Denisha Coppock, told WTEV. The victim's family members say they do not believe any adults were around at the time of the accident. "I think the parent and the child need to be charged. Because you have to take charge of your household and you have to be responsible for what goes on in your house," said Shaleena Hamilton, Montrez's aunt. The 12-year-old suspect has been charged with involuntary manslaughter, reckless conduct and possession of a firearm by a person under the age of 18. He is being held in a juvenile detention facility. Investigators did not say whether they knew who owned the gun or how the boys got access to it.